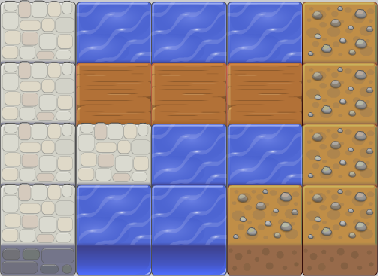 Graphics taken from Danc’s Miraculously Flexible Game Prototyping Tiles, which are awesome and free! How are you going to store this map layout in code? All those code snippets do the same thing. Then, when we want to find out what tile to place at each position, we can just look up the value of the element of the level array at that index. 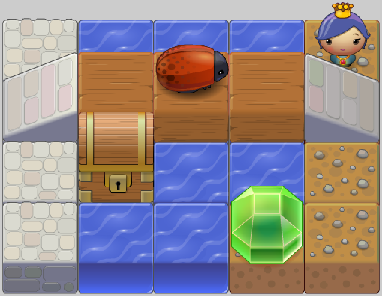 So, level will be equal to STONE, level will be WATER, and so on. It’s difficult to imagine how it could be simpler. So how can we do this for a 2D map? Like before, we can look at individual elements in the array; for example, level[1,3] is equal to WOOD and level[2,0] is STONE. …then Flash will just make a new regular, one-dimensional array with level equal to 4 and level equal to 5. We know we can store an entire single row in an array, so why not just make four arrays, and store one row in each? Now, level is an array of arrays. We call this “nesting arrays”, and we call each of firstRow, secondRow etc. “nested arrays”. This means that level is actually an array itself; level is equal to [STONE, WATER, WATER, WATER, DIRT]. And we can access elements within this sub-array — so, level is equal to STONE, level is WATER, and so on. In other words, we can access any element of this array of arrays using level[row][column]. Not bad! Using an array of arrays like this allows us to create ragged arrays — that is, arrays where the rows can be of different lengths. Note that instead of checking row <= 4, the outer loop checks row < level.length. level.length is the number of elements in the level array — i.e., the number of rows. Similarly, the inner loop now checks column < level[row].length, i.e. 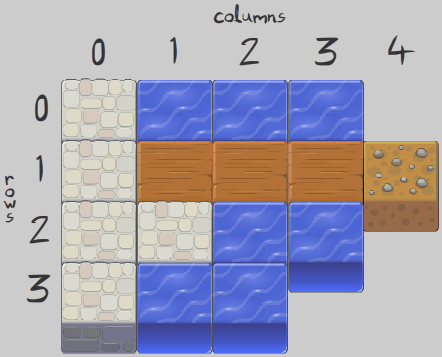 it makes sure column is less than the number of tiles in the current row. We aren’t restricted to two dimensions. We could use as many dimensions as you like, but anything above 3D becomes hard to draw. 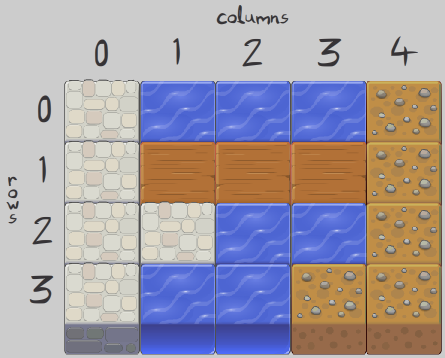 Here’s a map with rows, columns, and a third dimension: layers. Can you figure out how we could store it using nested arrays? Is there a way to accomplish this using Object literals? Hi! How i could add a mouse event.CLICK to each of those graphics, which are placed on the stage using these methods? And after i have been clicked, then check what have i clicked and after that trace something or something like that. Jeetendra: you are correct. Oops. Thanks, this helped me a lot. You presented the solution very clearly and clean, keep it up.